We regret to have to inform Members that Chris Meek passed away last weekend after suffering from Cancer. Chris became a Full Member of the BRDC 20 years ago in 1996 and had just been accepted as a Life Member. After racing motor cycles in the mid ‘50s, Chris began racing on four wheels in 500cc Formula 3 with a car which he christened the Meek Empress, its first recorded appearance being at Chris’s local circuit of Brough in 1956. He soon switched to sports car racing with Lotus Types IX and X followed by an Alfa Romeo Giulietta Sprint Veloce and an Elva Courier. With the Elva Chris won the 1960 Gold Flake Trophy at Phoenix Park. A return to single seaters saw Chris racing the ultra low Formula Junior Elva 300 in 1962 before switching allegiance in 1964 to Ginetta with whose G4 he enjoyed considerable success at national level. In the late ‘60s Chris entered a number of 1600 cc Formula 2 events but his cars were uncompetitive and his only classified finish was ninth in the BARC 200 at Thruxton with a Brabham BT10. After a few races with a Chevron-BMW B8 as a member of the TechSpeed team, Chris moved into Formula Ford 1600 with a Titan Mk 6 entered by his property company Titan Properties Ltd. In 1970 with the Titan and in 1971 with a Tate of Leeds-sponsored Lotus 69F Chris won the BRSCC Northern Formula Ford Championship. The Tate support continued into Formula Atlantic with a Brabham BT38, a March 712 and then a Motul M1, Chris winning a British Championship round at Snetterton. One of the stars of Formula Atlantic was a young Welshman Tom Pryce whom Chris decided to support through Titan Properties, arranging for Tom to drive a Motul for Ron Dennis’s Rondel Racing team. At the end of the year Tom won the premier Grovewood Award. After a few F1 races with the Token RJ02 and victory in the Monaco F3 race in 1974, Tom became much sought after and signed for the Shadow team. Chris was continuing to race extensively at this time, principally in production sports cars such as a De Tomaso Pantera, Lotus Europa, a TVR 1600M, MG Midget and a Panther Lima. Between 1973 and 1980 Chris won six production sports car championships. 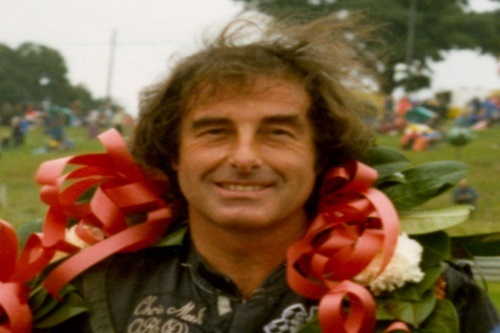 In the early ‘80s, Chris raced rather less but remained an important personality in British motor racing when he arranged for Titan Properties to acquire the freehold of Mallory Park circuit which it retains to this day. Always a colourful, flamboyant character, Chris owned in excess of 40 Ferrari road cars over the years and was not reticent about exploring their full potential. He also had a succession of spectacularly quick road bikes. The BRDC offers its sincere condolences to Chris’s wife Svetlana and their two sons. The funeral, to which all are welcome, is to take place on Friday 3 June at 1.30 pm at St Anne’s Cathedral, Great George Street, Leeds LS2 8BE.